The JSE started the week on the backfoot as it closed weaker mainly on the back of losses recorded in financials. There was little or no sentiment that filtered onto the JSE from Asia as most markets will be closed this week to commemorate the Lunar new year. In Europe equities traded mostly flat as the momentum from Friday’s US jobs report seemed to have faded. Trading direction on the JSE was mainly driven by the rand which traded mostly weaker in today’s session. The rand retraced mainly on the back of a minor rebound in the US dollar which came under pressure last week’s following the US Fed’s interest rate decision. The rand slid to a session low of R13.41 against the greenback before it retraced to trade 0.6% weaker at R13.39/$ at 17:00. EOH Holdings [JSE:EOH] was one of the day’s biggest losers after it lost 8.38% to close at R25.48. AngloGold Ashanti [JSE:ANG] also traded under considerable pressure despite releasing a trading statement indicating that the company was expecting to report a profit in tis full-year results. This was mainly due to the significant once off impairments that the company flagged in the statement. The stock fell 5.41% to close at R179.71. Mr Price [JSE:MRP] lost 5.27% to R211.50, Truworths [JSE:TRU] closed 5.2% weaker at R76.95 and Woolworths [JSE:WHL] dropped 4.94% to close at R47.88. Financials were also weaker due to the softer rand which saw ABSA Group [JSE:ABG] drop 4.14% to close at R175.33, while Standard Bank [JSE:SBK] lost 3.32% to close at R187.80. MTN Group [JSE:MTN] closed at R85.86 after dropping 2.54% despite releasing a positive trading statement. Clover Industries [JSE:CLR] rallied by 15.05% to close at R23.01 after the announcement of a firm intention to acquire all of the company’s issued share capital at a premium to where the stock has been trading recently. Lonmin [JSE:LON] also recorded a significant jump as it closed 9.83% higher at R10.50. Impala Platinum [JSE:IMP] was buoyant mainly on the back of the release of its trading statement which saw it add 7.92% to close at R41.82. Sibanye Stillwater [JSE:SGL] managed to post gains of 2.07% to close at R12.35, while Intu Properties [JSE:ITU] closed 1.72% firmer at R20.70. 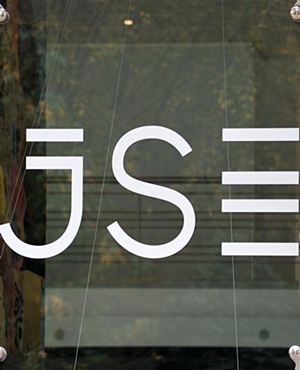 The JSE All-Share index eventually closed 0.77% weaker, while the JSE Top-40 index dropped 0.82%. All the major indices closed in the red in today’s session. The industrials index lost 0.59%, resources index weakened by 0.21%, while the financials index fell 2.4%. At 17:00, gold was 0.55% weaker at $1310.68/OZ, platinum had lost 0.67% to trade at $818.63/Oz, however palladium bucked the trend to trade 0.73% firmer at $1364.58/Oz. Brent slipped along with other commodities as investors scurried for the strengthening US dollar. The commodity was trading 1.08% weaker at $62.074/barrel just after the JSE close. At 17:00, Bitcoin was down 0.6% at $3486.30/coin while Ethereum was down 0.57% at $108.46/coin. *Musa Makoni is a trading specialist at Purple Group.